I generally buy Turkish dried chickpeas which I keep in the pantry, and then soak in a bowl of water over night in the fridge (12 – 24 hrs) and cook till soft just before making this recipe. Save the cooking water to make the hummus! To keep life simple I then put all the ingredients into a blender at once and mix until I have a very smooth paste. I use 8 tablespoons of warm water for this recipe, but you can always substitute olive oil if you prefer. A classic …. so good when it is has the right consistency! It never last long and is always gone almost before it is served on the table! 1. First of all, always use dried chickpeas – it’s not only healthier but also tastes better. 2. Second – try soaking the chickpeas for 12, or even 24 hours, in the fridge. This will shorten the cooking process and will prevent the chickpeas from splitting and loosing taste. 3. Use the water in which you cooked the chickpeas. 4. 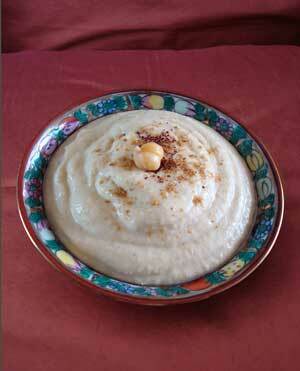 Use a larger amount of tahini – about 1/3-1/3 a cup. Make shure you are using the best tahini you can get! 5. Use small chickpeas – not the garbanzo Spanish variety (which is great if you’re making chickpea soup, but aint so good if you’re making hummus). Check out my blog for more hummus tips and feel free to ask questions – hummus is my expertise. OLIVIER : I have also started using the hummus in sandwiches, the options are endless! SHOOKY: thanks for your comment, this is great and so informative! I am a beginner when it comes to making hummus so all advice is welcome. So far I have only used dried Turkish chickpeas, and funnily enough put them in a covered bowl of water in the fridge overnight to hydrate them & keep them fresh – I was doing this correctly and didn’t even know! Hi there, my hubby H loves Hummus. And I agree that the store bought kind isn’t as good . Especially bad are the ones in the can, I’m sure u know what I mean!! Looking forward to your homemade tahina, wonder how that’s done though. Do u just grind the sesame seeds and it works? Like peanut butter? Happygrub – sorry I don’t know your 1st name yet 🙂 Thanks for the comment. Ohh canned varieties… and store bought brands in general always have this funny aftertaste…. I think the only way to get around this is to make your own fresh hummus. As for the tahina, as far as I can see it is generally made with white sesame seeds and oil (ie olive oil) blended together. Some recipes add water others don’t. A little along the lines of making peanut butter as you say. I will post my results once I have made it! Yup, so that was what was wrong with the store bought type! It had this strange earthy after taste. Not that I’ve tasted earth before, even f I did, its not in part of a fond childhood food memory 🙂 Looking forward to the tahina post! I add paprika to my finished hummus as well as some good virgin olive oil. But I have been having trouble getting the right consistency – any tips? 1st love the pictures on your blog, look forward to reading in depth what you have been up to in the Kitchen. By the way, where are you in Canada -I lived in Oakville Ontario for many years! -keep blending until smooth. Add a little more liquid based on your desired texture. If you have a chance to try my recipe above I would love to hear how it turned out. I am defintely trying your hummus soon, so I will let you know how it goes.. and do let me know how the cheesecake turns out! I live in Montreal – but I know quite some people from Oakville! Yum! And now you have me thinking about making my own tahini since I have a hard time getting it–I’m pretty sure we have sesame seeds around here someplace as the Calabrians make a kind of candy with them at Christmas time. Hmm….. I bought the chickpeas, the sumac at a gourmet food store and I am frustratingly looking for the tahini.. grrr.. I went to about 3 different places. I think I’ll have better luck at another store which is a little out of the way. I wish I had bought it when I saw it before.. Any luck with making ur own?? Traditionally hummus is made with either tahine or oil, but not with both, hence there dips are known as “hummus bi tahine” or “hummus bi zeit.” Just fyi. It looks delicious! FARHAN: This is great news – so pleased that the hummus turned out well!!! I too found that a little extra liquid ie oil makes all the difference regarding the consistency.